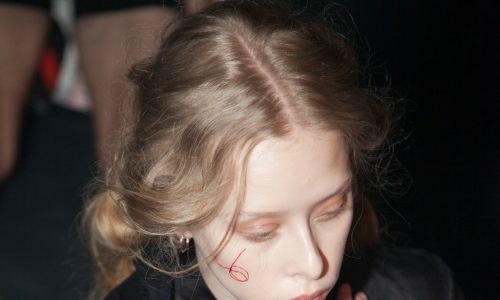 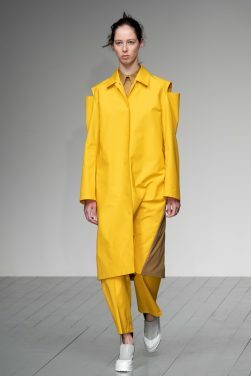 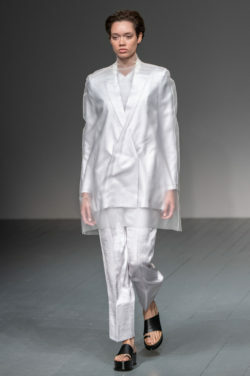 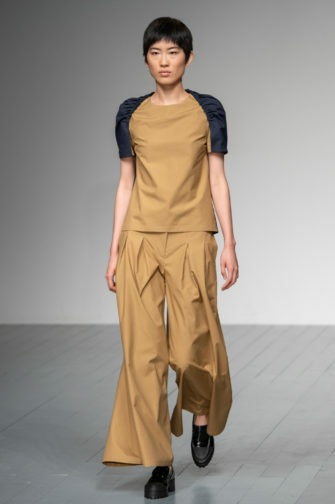 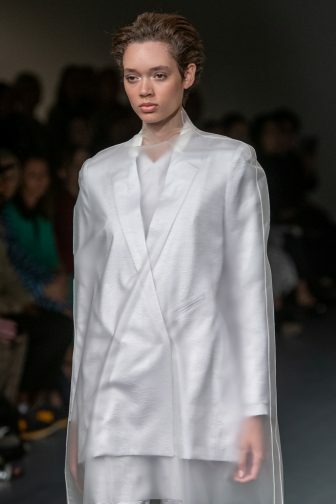 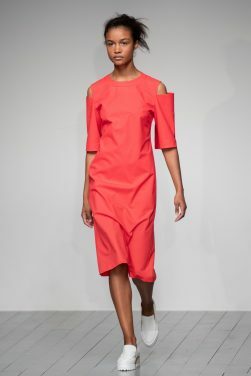 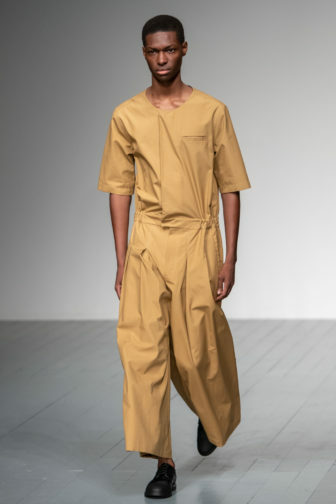 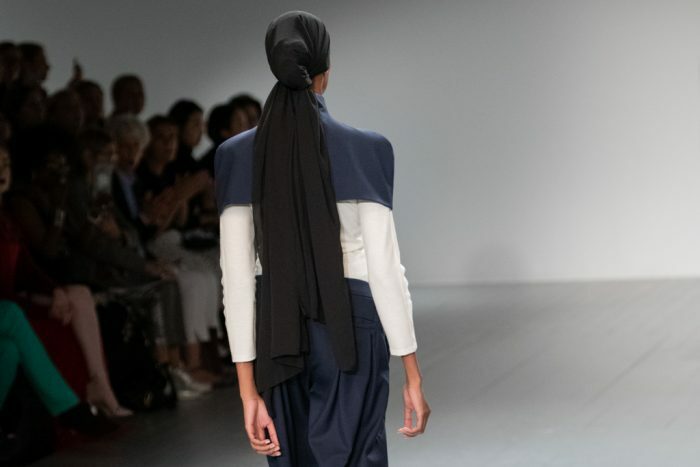 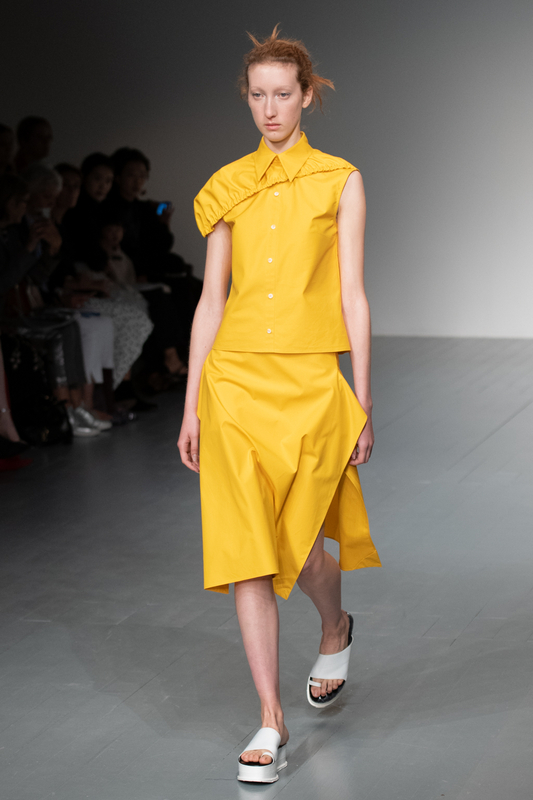 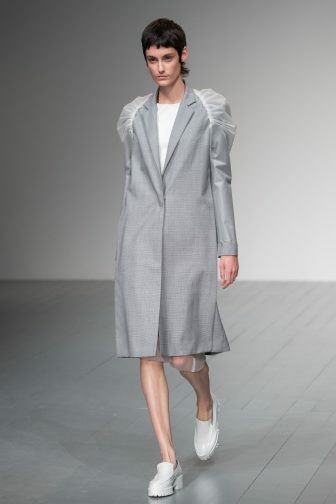 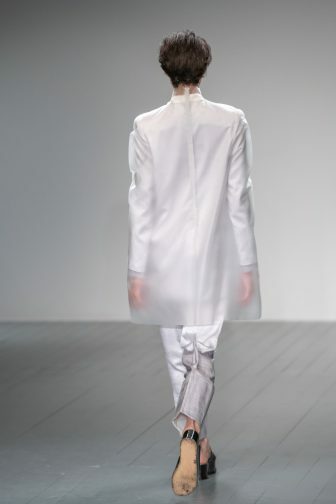 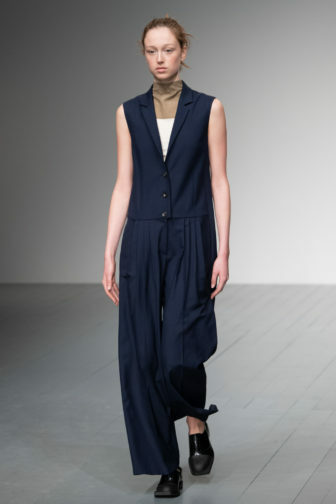 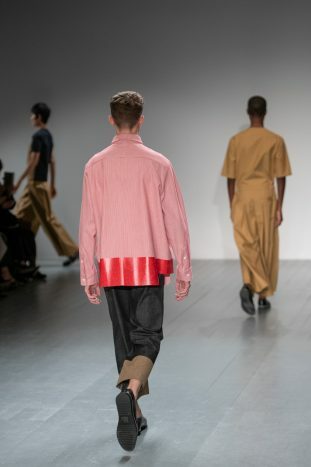 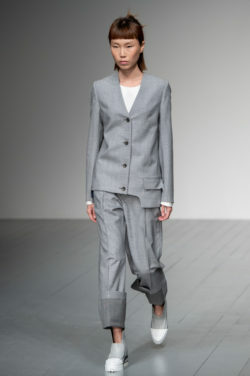 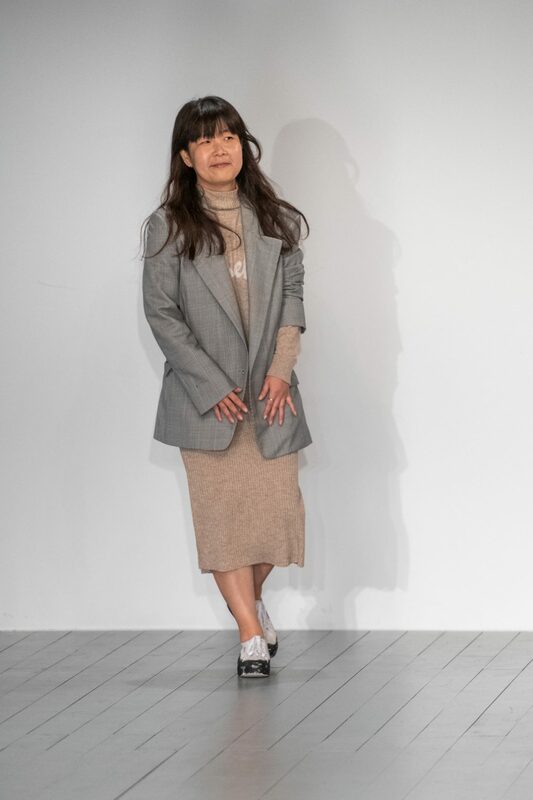 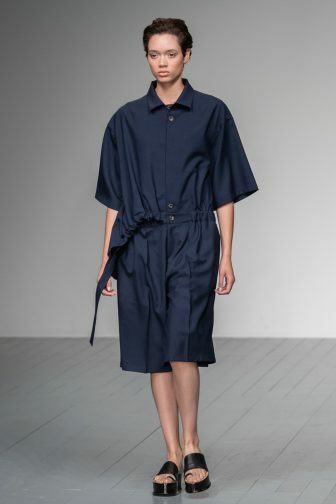 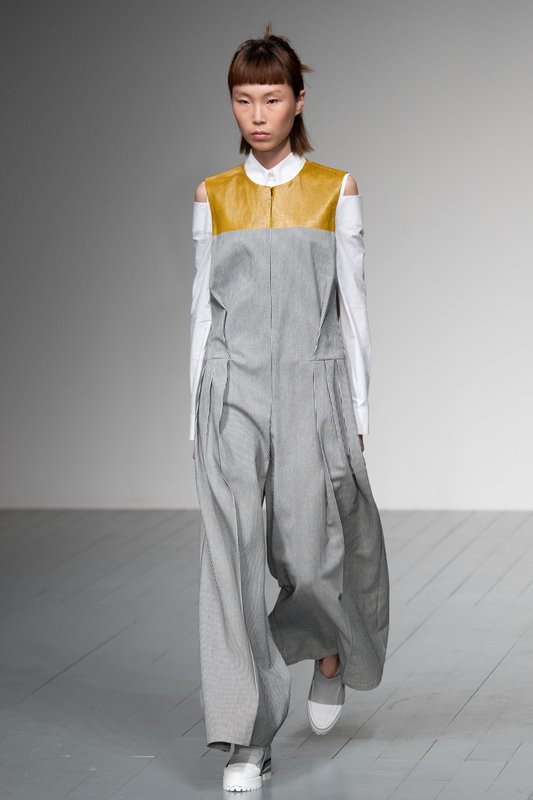 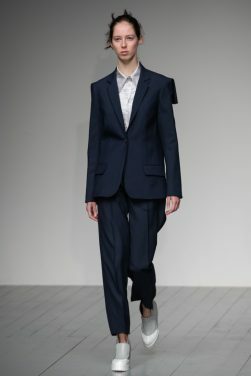 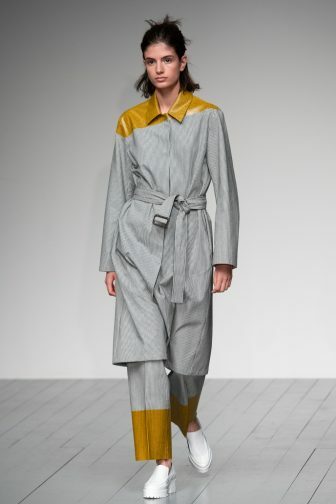 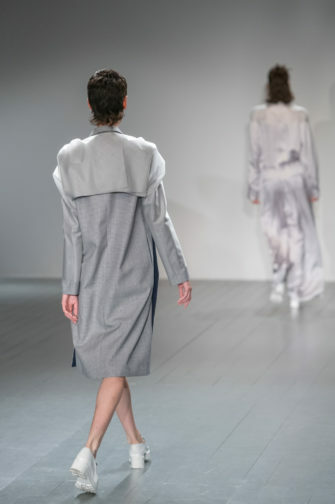 J. JS Lee continued to deliver her signature sleek, androgynous tailored pieces in her SS19 collection. Buttercup yellow was a unique colour addition to an otherwise modern, utilitarian palette of muted stone and navy. 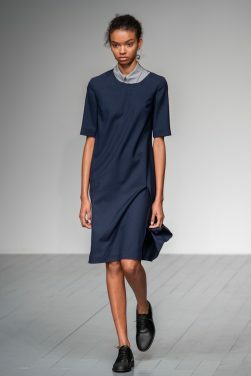 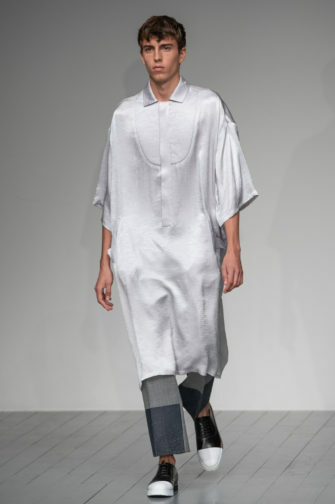 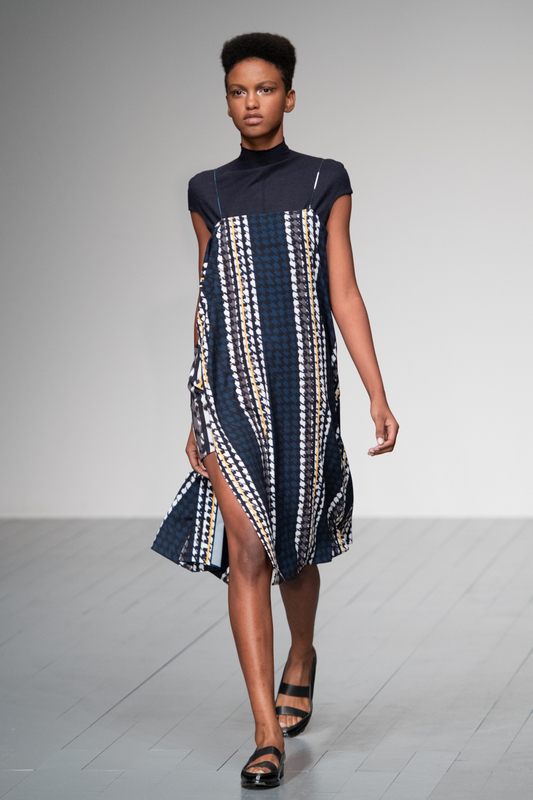 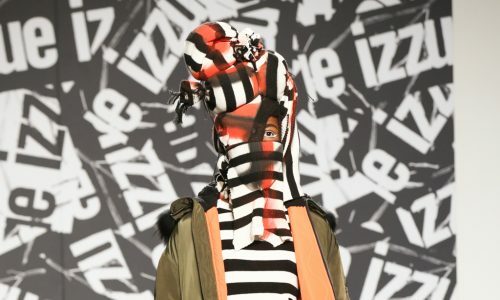 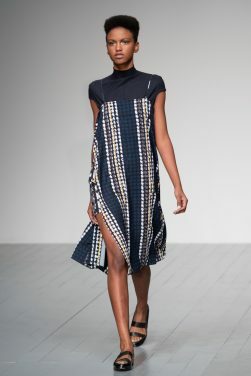 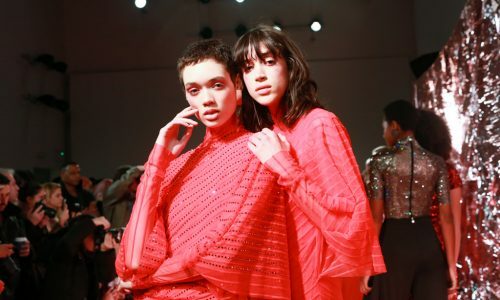 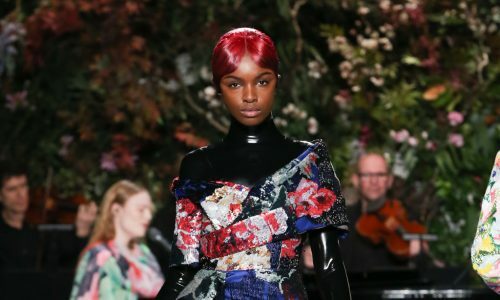 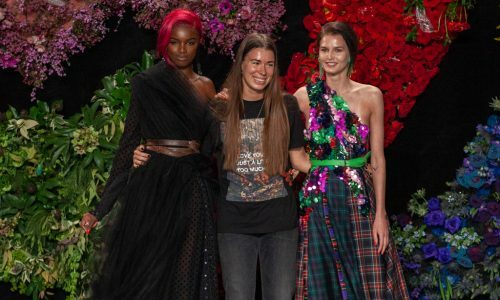 It was a no-frills, no-bells-and-whistles, no-nonsense affair – the headstrong focus of the collection was on the clean-cut lines of each garment. 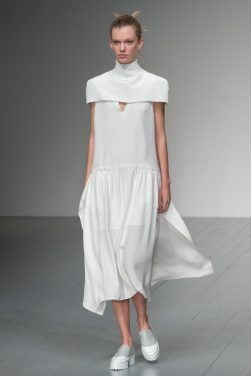 Minimalism was key, but there were a few eye-catching motifs. 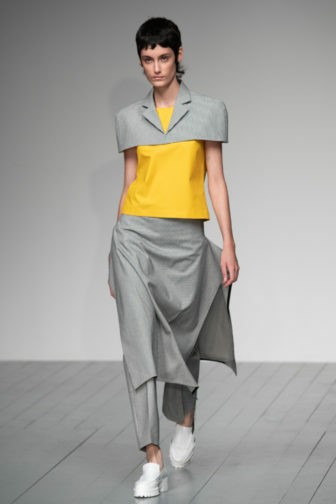 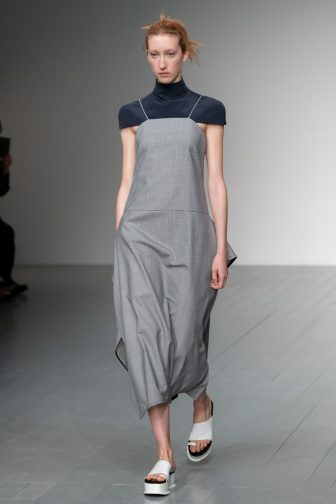 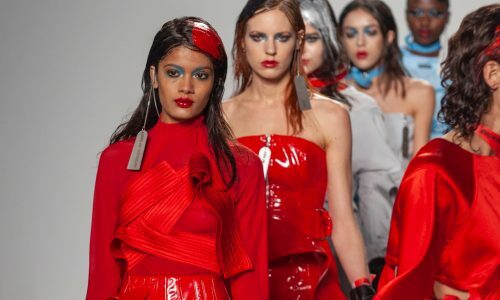 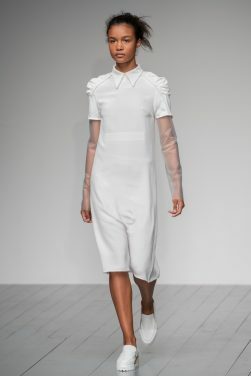 Block colour hems and ruched details, clear PVC sleeves and shoulder covers alluded to the contemporary, or perhaps more to futurism. 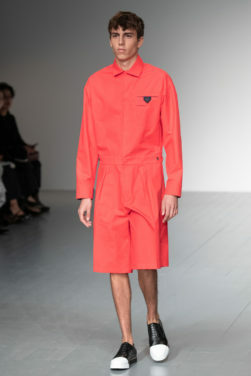 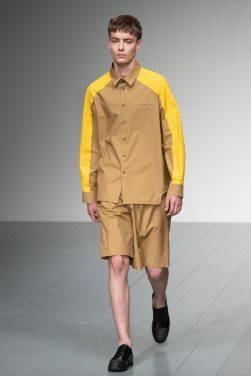 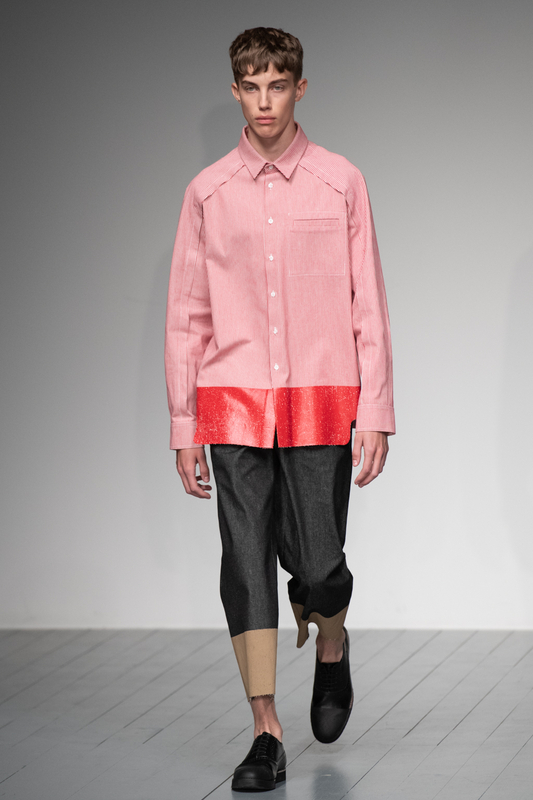 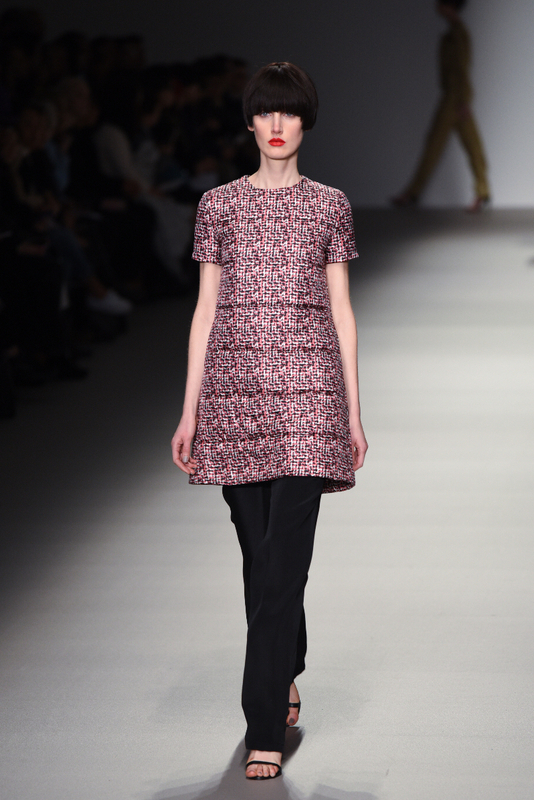 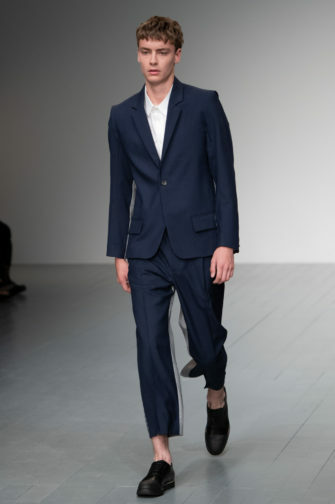 Boyish, straight silhouettes were applied to both the womenswear and the handful of menswear looks that were showcased. 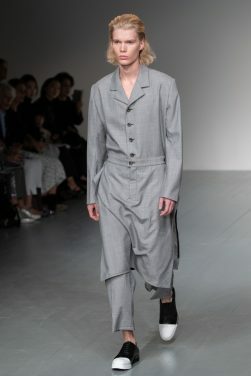 Trousers were either straight or wide-legged. 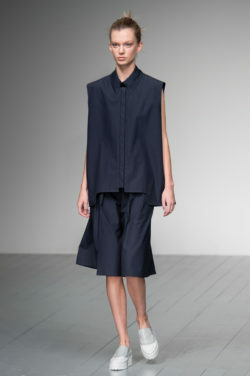 Shoulders were angular. 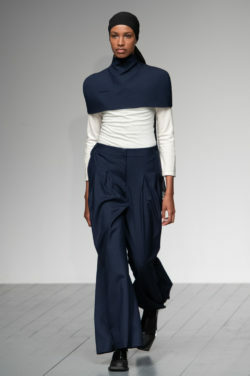 The head-to-toe ensembles were mostly kept monochromatic so as to not distract from Lee’s craft. 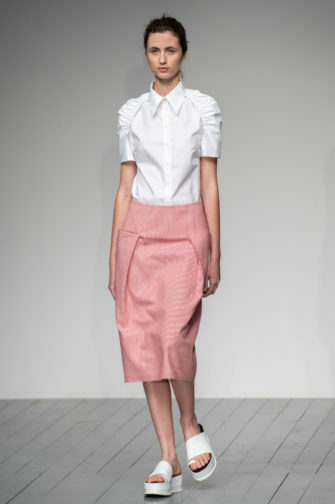 The collection evolved to become softer and more feminine with lighter hues. 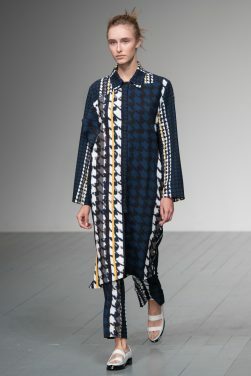 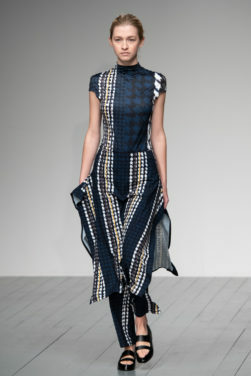 A blurred, ikat-like print cascaded down navy co-ords in a more fluid fabric to its predecessors. 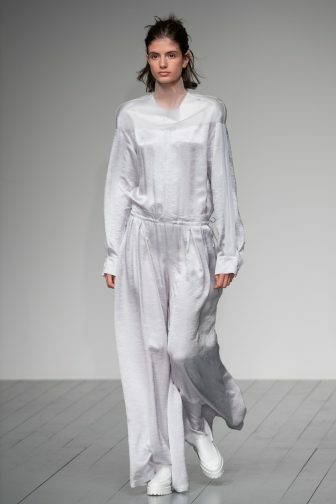 Hammered satin jumpsuits and floor-length dresses were silver in tone and pearl in finish, catching the light with every movement.